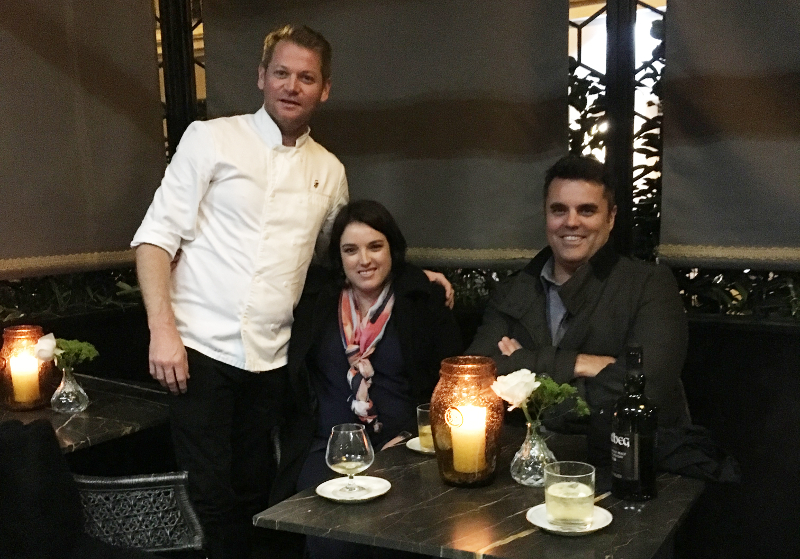 A handful of select diners recently enjoyed the exclusive experience of a flavour and sensorial feast of South African inspired dishes in the Michelin-starred Restaurant JAN in Nice, France. They were treated to a once-off, eight course culinary tour de force conceived and prepared by chefs Jan Hendrik van der Westhuizen of Restaurant JAN and Peter Tempelhoff of the Greenhouse in Constantia, Cape Town. Accompanying each course of culinary delights were carefully selected wines crafted by the father-and-daughter winemaking team of Carel and Margaux Nel and presented by marketing daughter Rozanne Nel of Boplaas Family Vineyards, Calitzdorp in the Klein Karoo. The amuse bouche was buchu, cucumber and oyster; Karoo ostrich tartar king cone with rooibos cream and onion marmalade. 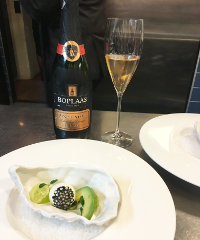 Wine pairing: Boplaas Méthode Cap Classique, traditional style bottle-fermented sparkling wine. Consisting of 95% Pinot Noir and 5% Chardonnay, the wine spent seven years on the lees in bottle prior to dégorgement, with zero dosage – displaying notes of fine, persistent mousse, hints of brioche, raspberry fruit and strawberry jam with subtle spice. Complex and rich on the palate, with lively and a refreshingly dry finish. 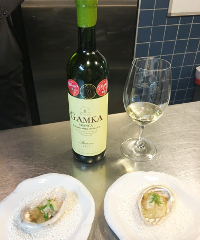 Paired with the Boplaas Gamka Branca 2016 – a Cape white blend with a Portuguese twist: Chardonnay, bush-vine Chenin Blanc, Grenache Blanc, Viognier & Verdelho. Gamka is the ethnic Khoi word for “lion”, while Branca is the Portuguese feminine form for “white” – the lioness of Boplaas pride. Barrel-fermented and matured for nine months in old French oak. Notes of green citrus, naartjie fruit undertones, yellow grapefruit, melon and subtle spice. 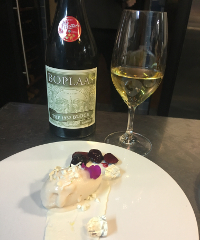 This dish was paired with Boplaas Touriga Nacional 2015 – a toast to the Klein Karoo region and the premium grape of Portugal. Traditionally vinified in lagers (“kuipe”) and matured in a combination of old French oak casks to capture the exuberance of this aromatic red variety. Crunchy red plum flavours, with mulberry, bramble, subtle all-spice and hints of liquorice, with dry tannins. 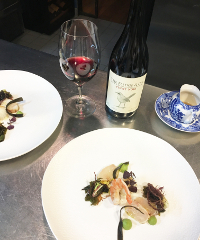 Fledge & Co Pinot Noir 2016 – from the best five barrels selected of this cool climate, classic Elgin Pinot Noir. Flavours of rose petals, bright cranberry, cherry, raspberry, black tea and Turkish delight with mouth whetting acidity and good length. 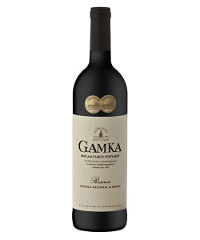 Paired with Boplaas Gamka 2015 – Portuguese-led flagship red blend: Touriga Nacional, Tinta Barocca and Shiraz. Gamka, meaning “lion” in the Khoi native language, is also the name of the river which provides the life-giving water that nurture our vines. This river starts its journey in the Great Karoo, passing through three mountain ranges before draining in the Indian Ocean near the place where the first Portuguese adventurers set foot on Southern African soil. From low yield, old vines, traditionally vinified before 16 months’ maturation in fine new French oak barrels. Bright garnet red wine billowing from the glass with black hedgerow fruits, tart cranberry, ripe plum notes and spice. The fruit is buttressed by fine oak tannins on the savoury palate, with hints of fynbos, while charcuterie and bacon fat properties round out the wine. 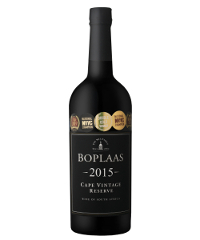 Boplaas Block 1932 Hanepoot 2015 – first vintage from this small block planted in 1932, among the oldest muscat vines in South Africa. These were planted by our neighbour’s grandfather on the banks of the Gamka River, having survived seven floods. Crafted by traditional method in open lagers. A bright lemon yellow wine with lime-tinged rim; the bouquet leaps from the glass with intense ripe Hanepoot grape flavours, pineapple, lemon rind, litchi and winter melon intermingled with hints of jasmine, honey suckle and faint spicy notes. 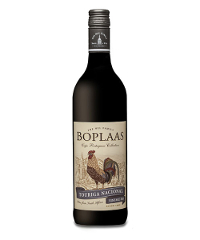 Paired with the Boplaas Cape Vintage Reserve 2015, which continues the Nels’ heritage of crafting fine Cape fortified wines from Portuguese varieties, traditional vinification methods, while remaining true to style to create a wine which will offer decades of enjoyment. Crafted from four old-vine Portuguese varieties, hand-harvested at optimal ripeness and fermented in lagers. An inky black wine with hints of fiery garnet on the rim; with a bouquet of crushed blackberry, tart cranberry, kirsch and purple plums – with bright all-spice top notes harmonised with fynbos and savoury undercurrents. The bouquet unfurls onto a bold palate with liquorice, red fruits and cacao hints to the dry finish. From the Boplaas distilling heritage dating back to 1880, when current owner Carel Nel’s great-great grandfather, Daniel Nel, exported his first consignment of fine Boplaas Brandy to England. In those days the barrels of brandy were transported by oxwagon to Worcester and then to Cape Town by rail before being shipped to London. 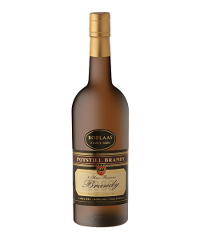 Boplaas was the first cellar to release an Estate Brandy in 1994, following a change in the relevant legislation in 1989. The delectable result of eight years in old Limousin and Port casks, the climatic conditions of the Klein Karoo, and the insatiable thirst of the local angels which take their “evaporation share” – a brandy brimming with ripe stone fruit, with honey, herbal and floral notes and a sublimely smooth mouthfeel and finish. Restaurant Jan is a fine-dining restaurant in the fashionable district of Port Nice on the French Riviera – offering South-African hospitality and serving food inspired by local produce from the markets of the south of France. Originally from the Karoo town of Middelburg, South Africa, owner Jan Hendrik van der Westhuizen adapts and serves South African favourites like melktert and biltong to discerning culinary audiences in Europe.